Daoist monk Zhou, Xuan-Yun (Mysterious Cloud), grew up in a temple on Wudang Mountain, China where he was a student and later an instructor of Taiji and Kung Fu. 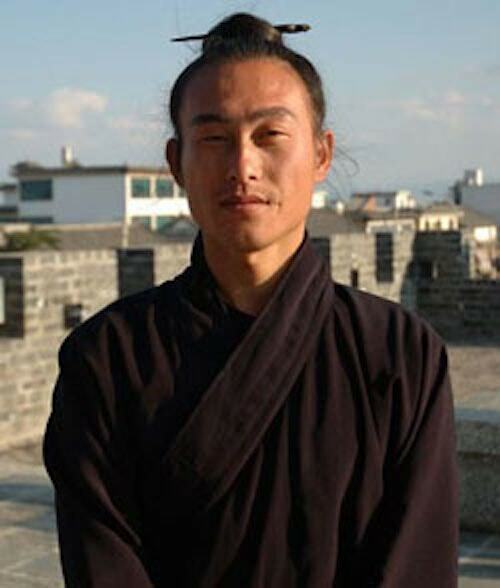 He belongs to the Orthodox Unity sect of Daoism, and is trained in ritual arts, chanting, divination, and internal alchemy. At the age of 20, Xuan Yun left Wudang Mountain to live as a wandering monk. He traveled alone around China for four years, in order to seek out and dialogue with fellow martial artists. In 2005, Xuan Yun moved to Dali City, in Southwest China’s Yunnan Province, where he dedicates himself to sharing the martial arts. With over ten years of teaching experience, he has taught students of all ages and from over 25 different countries. He has been featured in several Chinese documentaries on the martial arts. Xuan Yun also enjoys hiking, plays the bamboo flute and is a great cook. Master Zhou, Xuan-Yun currently divides his time between China and the United States. In China, he offers classes on traditional Wudang martial arts, Qi Gong, and Daoist philosoply. He also teaches workshops in the United States. Private instruction with Zhou, Xuan-Yun is available for those who wish to study an unusual form or a specific weapon. These include sword, saber, whip, staff, and horse-tail whisk. The horse-tail whisk is a weapon practiced exclusively by Daoist monks, and until recently, was only practiced in secret. As of 2008, Zhou, Xuan-Yun is a featured writer for Kung Fu Tai Chi magazine. He is formally recognized as a disciple of Li Guang Fu 李光富 Head Daoist monk on Wudang Mountain (武当山道教协会会长).